Kenton Youngstrom, guitarist, composer, and educator is the first in a long line of prize-winning students of Jim Smith at the University of Southern California, where, while earning his Bachelor of Music and Master of Music degrees, he studied composition with Donald Crockett, arranging with Darniell Pershing, and film scoring with David Raksin. His eclectic performing career has taken him around the world, including appearances as a soloist with orchestras such as the Los Angeles Chamber Orchestra, Los Angeles Jewish Symphony, New Haven Symphony, Jacksonville Symphony, and Redlands Symphony. He has performed as an orchestra member with the LA Opera Orchestra and Long Beach Opera Orchestra. 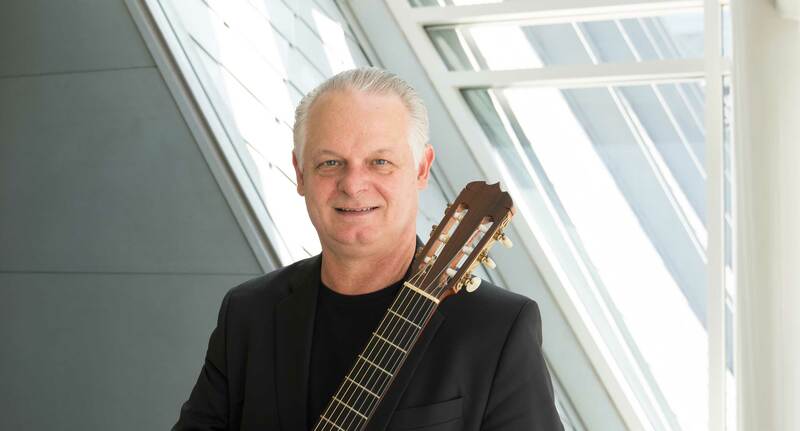 And he toured internationally with the Falla Guitar Trio, performing at the Dubrovnik Festival in former Yugoslavia, in Hong Kong, Geneva, throughout the US, Canada, and Mexico, and for Radio France. Mr. Youngstrom has performed concerts and recitals with numerous jazz notables such as pianists Taylor Eigsti and Dave Brubeck, flutist Hubert Laws, bassist Putter Smith, and drummer Paul Kribeck. He also led an international jazz big band at the Cannes Film Festival in France, sang and performed on vihuela with his own Mexican conjunto in the Tournament of Roses Parade, and played with the Margo Rey rock group at Nokia Theater in California and Mahaffey Theater in Florida. Producing credits include the Falla Guitar Trio’s Concord Records LP, Virtuoso Music for Three Guitars, which won a Record of the Year Award from Stereo Review magazine. Recent compositions include the score of Behind the Mask of Zorro (History Channel), Kengyadu – Three Movements for Guitar Trio and Orchestra (co-written with Gyan Riley and Dusan Bogdanovic), and Mary Pickford – A Life on Film (Milestone Films). Recent arrangements include Falla’s Noches en los Jardines de España for the Falla Guitar Trio and orchestra, Corea’s Children’s Song No. 6 for Quarteto Nuevo, Bach’s Musical Offering for the Red Quartet, jazz selections for the Pasadena Jazz Orchestra, and the movie 7 year ZigZag (Next Step Studios). His most recent release, 2015’s Voices of the Collection, Vols. 1 & 2, featuring 55 classical pieces performed on 55 world-class instruments, was recorded for the Second Edition of Sheldon Urlik’s book, A Collection of Fine Spanish Guitars From Torres to the Present (Sunny Knoll Publishing). Mr. Youngstrom teaches guitar at the Colburn Community School of Performing Arts in Los Angeles.